FSN Creatine HCL is the source of pure creatine hydrochloride, a more stable version of a popular dietary supplement. It allows to maximize energy efficiency of the organism and increases the pace of progress on training. Creatine constitutes one of the best-researched dietary supplements available on the market. For ages it has been universal support for sportsmen of various disciplines, gaining recognition as one of the most effective products promoting physical abilities. Due to its high effectiveness, its side-effects were looked for, but unsuccessfully. Further studies prove that creatine is a supplement which is not only highly effective, but also safe. In some cases, it may even have a pro-health effect, for example demonstrating neuroprotective properties. By being a basic substrate on the pathway of energy extraction from phosphagens, creatine is an important factor conditioning the organism’s efficiency during short-lasting efforts. Its supplementation directly increases its availability in terms of energy metabolism, promoting physical abilities of the organism. It is reflected in increased physical efficiency, delayed fatigue and related drop of abilities and more efficient power generation. Thanks to this, creatine allows to increase the pace of progress noted training by training. A natural consequence of increased training intensity is more intensive muscle anabolism. Additional properties of creatine for the promotion of building muscle mass also result from its ability to inhibit myostatins, factors limiting anabolism. By reducing their activity, creatine slows down the factor inhibiting the growth of myocytes, which enables easier gain of muscle mass. As for anabolism, the ability of creatine to increase satiation of myocytes with body fluid is also very important. By promoting the amount of sarcoplasm in muscle tissue, the supplement not only contributes to optimal muscle gain, but it also optimizes intracellular environment, conducive to the reactions that take place there. It means better conditions to carry our anabolic transformations. Creatine demonstrates positive influence the functions of the nervous system. It is indicated that it positively influences neuronal conduction by the promotion of the activity of neurotransmitters, therefore it may promote cognitive abilities. Apart from this, it has neuroprotective effect, protecting nerve cells from toxic activity of glutamic acid. 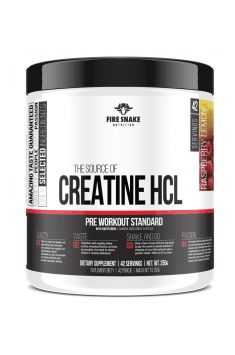 To sum up, FSN Creatine HCL is a highly bioavailable form of creatine, a universal, incredibly effective dietary supplement, demonstrating high potential to promote effort abilities, regardless of the discipline. It enables maximization of training effectiveness, constituting important support regardless of the aim or training advancement. Use one portion (1/2 scoop) before training. Use one serving (1/2 scoop) at any time of the day. Due to high stability of this form of creatine, it does not seem necessary to increase a singe portion of the product above the dose of 5 g per day, recommended by the producer, even in advanced sportsmen with considerable body mass. According to the current knowledge based on numerous studies on creatine, there is no need to apply cycles in supplementation among healthy people. FireSnake Nutrition is a Polish supplementation company, the headquarters of which is located in Rzeszow. It is characterized by high dynamics of development, thanks to which it constantly launches new products into the market. FireSnake Nutrition’s offer contains a wide range of dietary supplements from the group of pre-workouts, protein supplements and pro-health products. They are characterized by carefully selected composition, attractive price and high quality, which has been confirmed by many certificates. Thanks to cooperation with the centers in Germany, Poland and Ireland, the company includes the best materials in their products, thanks to which it is able to meet the expectations of the most demanding clients! Maltodextrin, aroma, (sucralose, acesulfame K, sodium cyclamate, sodium saccharin) - sweeteners, betanin - dye, silicon dioxide - anti caking agent.